Joan and I have worked with mutual clients for years and so I have had a deep respect for her on a business level for a very long time. From the business standpoint she always listened to the client, had a unique way to glean the information from the client that was necessary to formulate the necessary business agreements which always protected the client’s interests. Watching her transform her own life and become an “Empowerment Instigator” was not only inspiring, but not surprising either. Someone who knows how to dig deep and create her own purposeful life, can probably help me find my purposeful life too, I thought. I contacted Joan after doing some soul searching about generational habits and how to kick some of those bad habits and yet preserve tradition to become a leader for my family. She helped me recognize the values that define me, and helped me discover the tools that will refine me far into the future. I discovered the importance of self -care while still maintaining the leadership roles that are important to me. I found that changing my thinking would empower me to move forward in my business and personal life to change the things that would move me toward the inspired life that was meant for me. I will be forever grateful that her program help me discover my best self and the tools I have learned to use will help me also become the type of leader that I strive to be for both my business and personal life. Empowerment… what does it mean? Intellectually, I believed I KNEW the definition but it wasn’t until recently, and only as a result of working with Empowerment Instigator, Joan Jakel, that I realized I did not KNOW, from my true place of KNOWING, the truest definition of the word. In fact, I had never heard of an Empowerment Instigator, until meeting Joan. Now, after these past several months, I KNOW without a doubt that Joan Jakel is more than an Empowerment Instigator. I believe her to be an “Earth Angel.” She walks amongst us with a heart of gold, wanting her fellow earthlings to live as fully, joyfully and as purposefully as possible. I am forever changed and grateful for what she helped me discover and acknowledge about my truest self. She guided me with books to read and questions to ponder while being totally supportive, non-critical and non-judgmental. What a joy to have learned to see myself, and our world, in new and wonderful ways. I FIRMLY believe that everyone needs to have a Joan Jakel experience, whether through an afternoon workshop or ongoing coaching sessions. You, too, will be forever changes as life sparkles anew for you too! 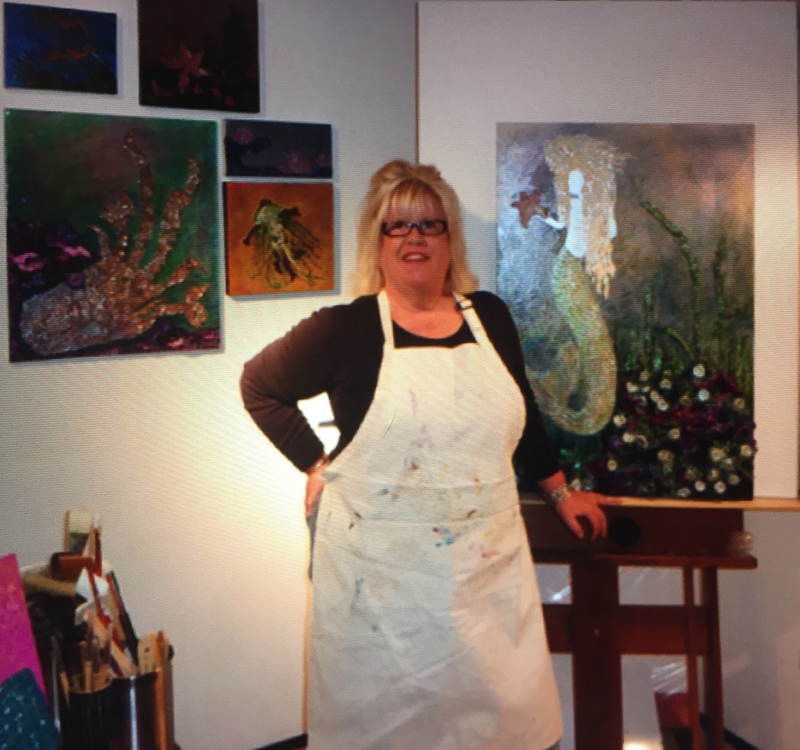 This past weekend, I was treated to a very special workshop, led by Joan Jakel at her Art Studio in Napa, CA. I have been a member of Joan’s Mastermind group that she held this summer, and the workshop was a culmination of all the work, growth and magic that I had been experiencing from Joan’s teaching, guiding and leadership. I didn’t have any specific expectations for the workshop; only I knew that whatever Joan said, and what direction she led us, it would be genuine and authentic. And it would be fun. Well, it was ALL THAT and more… I found my muse, spirit guide and my “elder” guides as well. Nothing was what I expected, yet the experience was familiar and perfect for me. Joan effortlessly led the group through our visualization, journaling and painting processes. She encouraged feedback from us; what we experienced from day one and what was frustrating to us. The connection of stress/health issues with life’s purpose (and ignoring it) was explained and tied to a very real experience one group member had. The painting was SO much fun, freeing and joyous…that I wanted it to never end! I am an artist, but don’t use painting in my art creation, so it was much appreciated! Joan constantly reminded us not to bring our inner critic out, but to accept the art you create AS PERFECT. As I painted my muse, she evolved and showed herself to me. She’s unfinished now, but you can see for yourself where she (and I) are heading! Joan Jakel’s workshop was incredible. Although I did not know exactly what to expect, with Joan, I always know I will be safe, nourished in comfort and Love. This fascinating workshop started with Joan’s own words about what and who exactly our Muse is and how we can find her. She lead us through two incredible guided journeys to help us realize what our Muse looked like and what messages there were for us in nature and in our own heart. 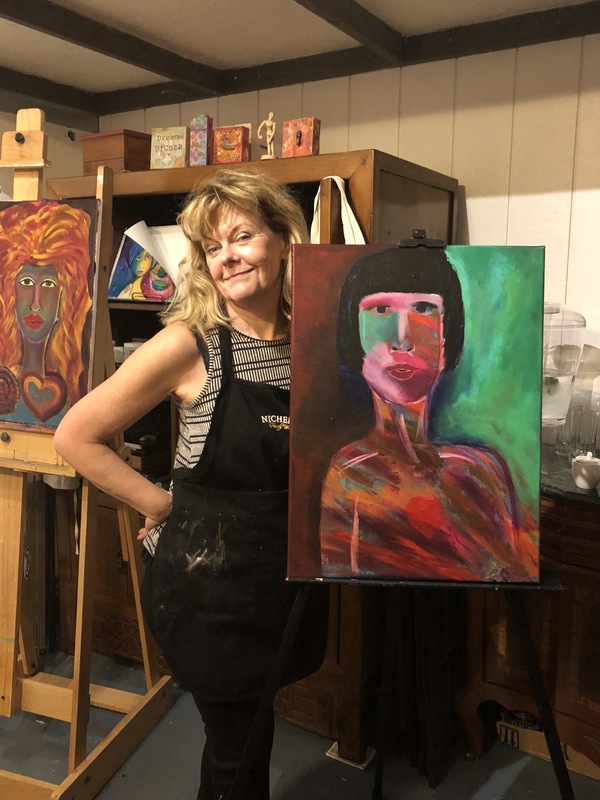 During our painting process, I always felt authentic, as she reiterated, “there are no mistakes and to trust the process.” I stayed open and I could hear from my heart and Muse what she wanted on the canvas while shutting out judgement and my inner critic, which are both such important life lessons. I would recommend this class for anyone looking to not only get in touch with one’s inner guide but have the confidence and ability to create her and access her in life. 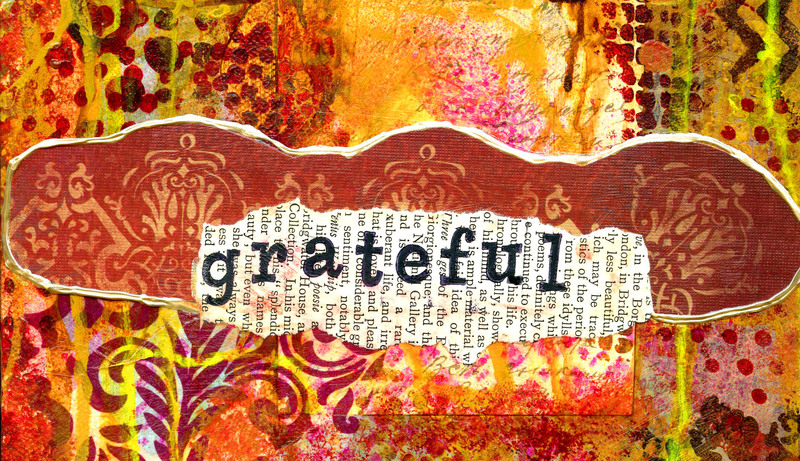 I absolutely loved every minute and process of the class that was filled with openness and love. Joan is a wonderful leader full of abundant inspiration. “So if you’re at the place in life where you have been considering making changes in your life and a vision board has piqued your interest, congratulations and kudos. I’ve read about vision boards months even years prior and though the seed had been planted, I still had feelings of ambivalence about going through with it. I can say – I thank the heavens that I had the courage to follow through and take Joan’s vision board workshop. Joan is an exceptional woman and teacher and in addition to having that talent of left brain cognition she also is blessed with the ability to easily tap into the right brain creativity. Her art speaks for itself. 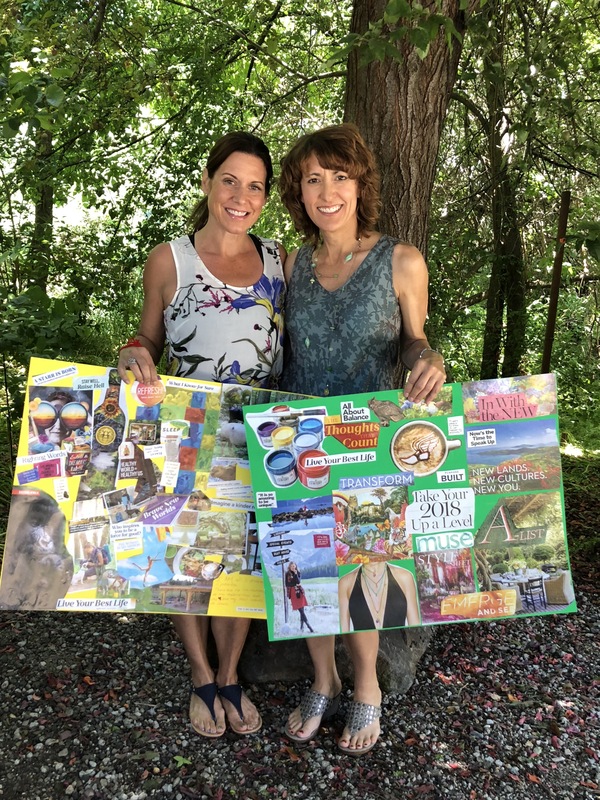 Joan Jakel’s “Create your Inspired Life Vision Board Workshop” offering came into my life at a time I was soul searching my place in life, (as we all do at any given time). I knew it would be inspiring and helpful because Joan is an angel amongst us all. I signed up about five days before our workshop. Soon after I received a worksheet with thought-provoking questions that not only helped for the day I created the vision board, but it allowed my heart to speak and acknowledge what I want to “Be, Do and Have” moving forward. 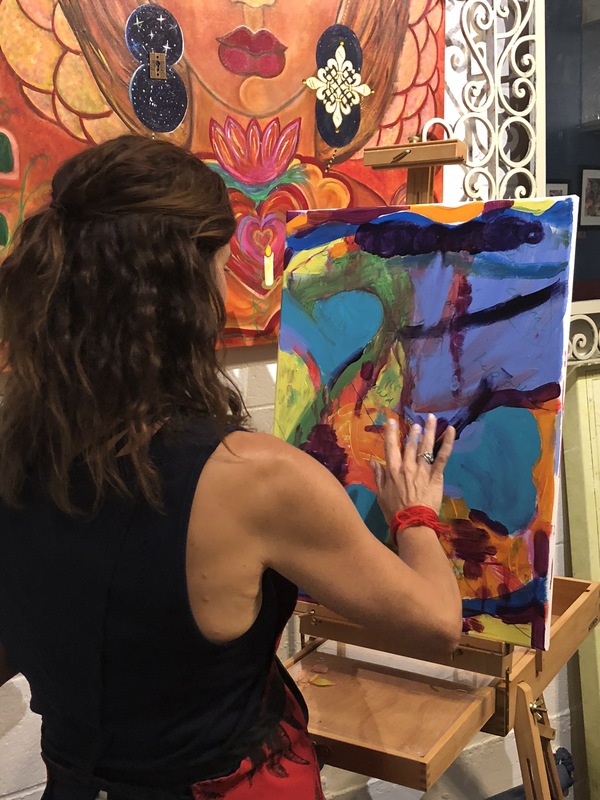 The day of the workshop, Joan provided a beautiful open setting filled with lots of colorful art tools and immediately I felt my heart’s most open feelings were safe in her care. We first took to nature and the most peaceful, meaningful poem and ceremony that joined teacher and participants. 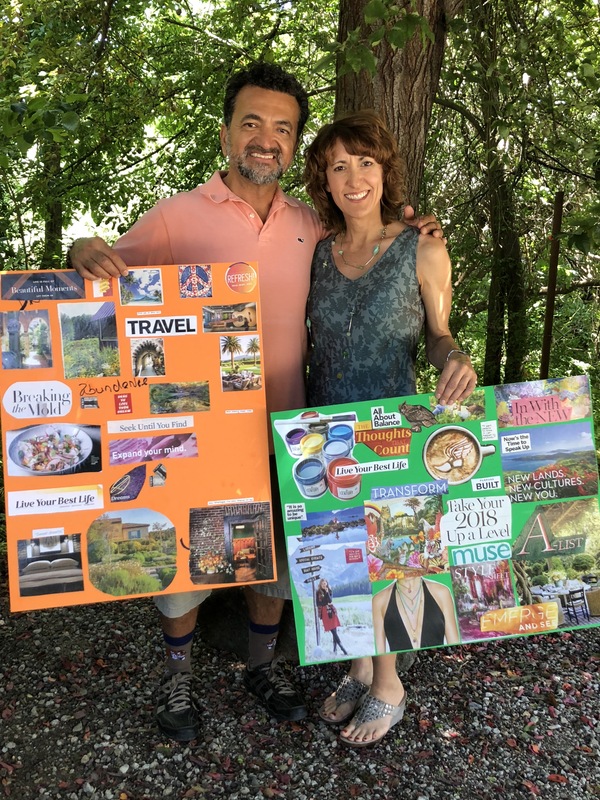 Joan then provided her own life as a testimonial to how creating a vision board ignites the universe to allow the things we desire in life to come to fruition. I could feel my heart smiling as we built our vision boards in our separate spaces while enjoying an expressive, loving and open conversation between the group. Once finished we all were in awe of our beautiful, personal creations with the common theme of “living our best lives”. Joan is an extraordinary person and leader who provides the journey to let you speak and hear what it is your heart is telling you. I would undoubtedly highly recommend this workshop for anyone and everyone who would like clarity of the of their purpose in life. Joan and the workshop exceeded the amount of fun, openness and magic one could have in a day. I have been clearer, happier and inspired each day since the workshop, and best of all, I see and feel the forward shift of the universe happening in my life. “In 2014, I learned about a grassroots concept for raising money for local charities. I was super excited and immediately thought about who I could get involved to launch this concept in Phoenix. Joan was at the top of my list. The only obstacle was she lived in Napa and I needed hands on help in Phoenix. However, I knew Joan would want to help since Phoenix was her community for over 25 years. I reached out to Joan and shared my excitement for 100+ Women Who Care Valley of the Sun. I explained the need for sponsors to cover our administrative costs since 100% of our donations go to the charities the groups select. I also wanted a special way to say thank you to these generous sponsors. At that moment, Joan and I knew what role she would play in our chapter. Joan has created over 15 custom thank you gifts for our sponsors. 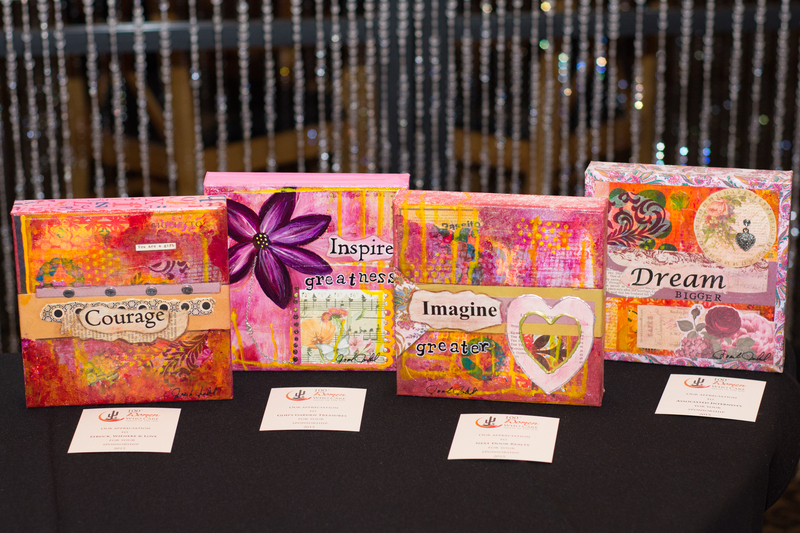 Each piece of art is a reflection of the contribution the sponsor provided to our chapter of 100+ Women Who Care. Joan learns about each sponsor before she embarks on her creative process. She puts her heart and soul into making a masterpiece the sponsor will treasure. Joan also includes a personal note to the sponsor explaining how the canvas was transformed from a blank slate to an expression of gratitude. Our sponsors are thrilled with their one-of-a-kind gifts! 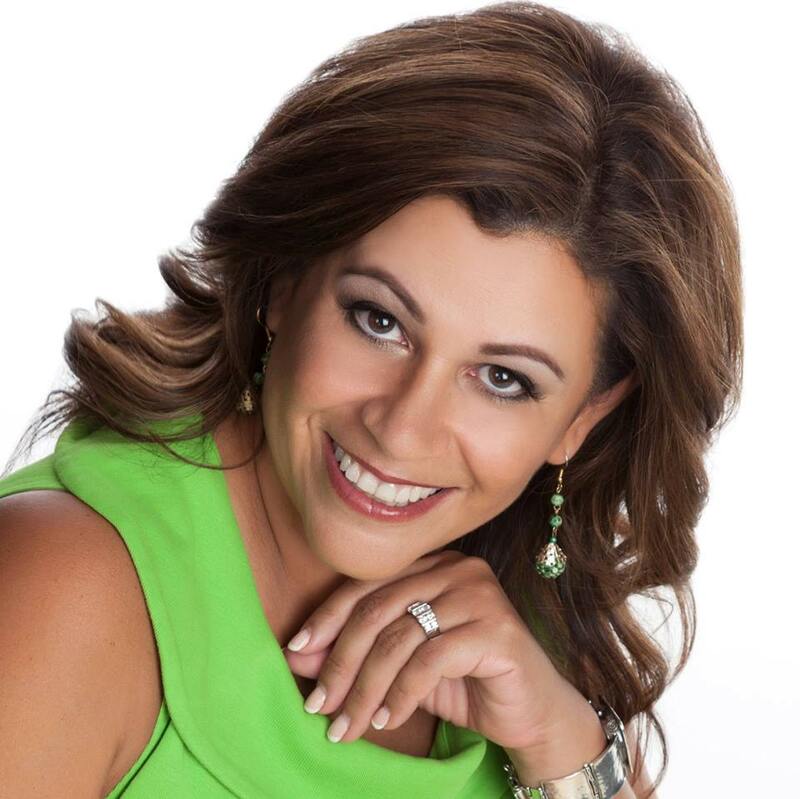 I have worked with Joan Jakel for the majority of my professional entrepreneurial life. While I’ve worked with a number of attorneys over the years, Joan became and remains my most trusted advisor. 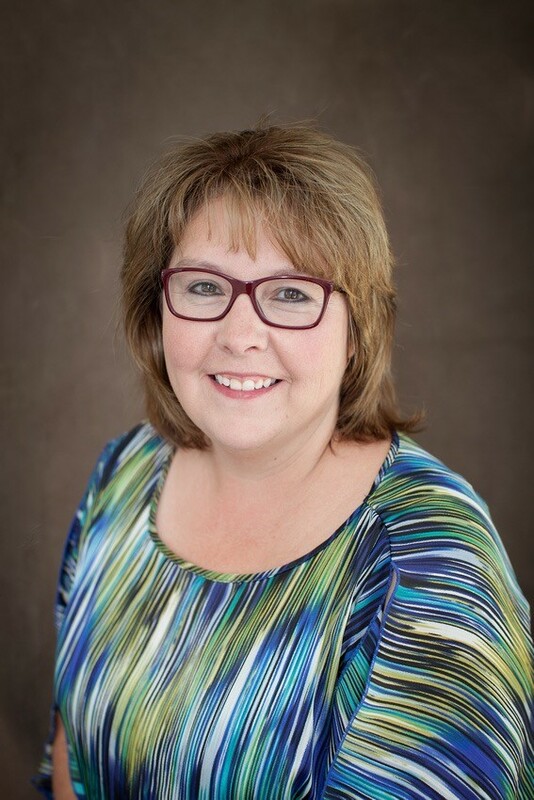 When founding each of our companies, we turned to Joan for all aspects of forming the entities and supporting our legal needs as we grew. She provides invaluable legal advice and counsel on a wide range of services – from formation to contracts to employment law. Joan is a fantastic listener, which enables her wonderful strategic advice and direct meeting of our needs. Joan’s understanding and application of business legal needs is only the beginning of what she has brought to our companies, and to me personally. She is a passionate advocate for what we have sought to build over the years. Joan encourages deep thinking and courageous action. 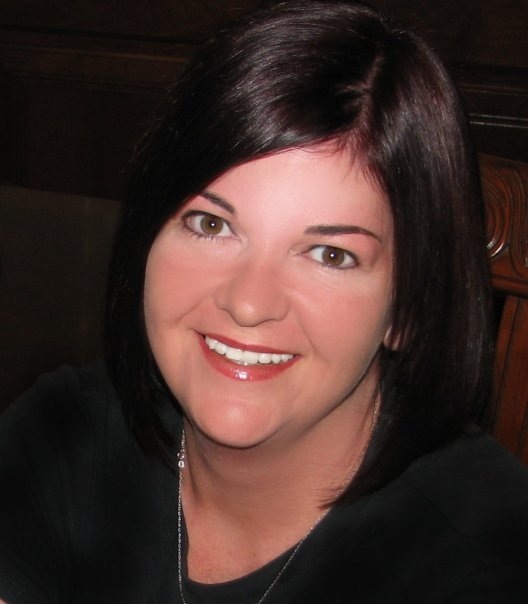 She is a cheerleader of our business successes, and a compassionate support when we needed it. Simply put, Joan has been much more than an attorney, she is our valued and trusted friend. You would be very fortunate to work with her.